08' 2dr LS swap build thread. I've never been particularly good at keeping up with one of these types of threads. I usually just do an entire project end to end and then post pics and answer questions. I will try to keep up with this one for any who are interested. Please bump the thread or ask for updates if I am lacking. I will take pics of anything interesting, tricky stuff to deal with, or anything you would just like to see. This is the best site I have found pertaining to info about the swap itself. We have the 2 premier vendors IMO for this swap here and active on a daily basis answering questions and sharing knowledge. This by itself is invaluable and had I not have had the chance to pour through miles of threads I wouldn't have felt comfortable taking this on. With all that said, there aren't a ton of individual build threads here for guys like me who are just dangerous enough with a wrench and just optimistic enough to try and tackle this job in their own 2 car garage with the body on. My recorded attempt at this starts now. Last edited by Dkjeep; 02-11-2017 at 12:13 PM. So basically the actual work for this started for me on a Friday 11/18/16 for those who are counting. 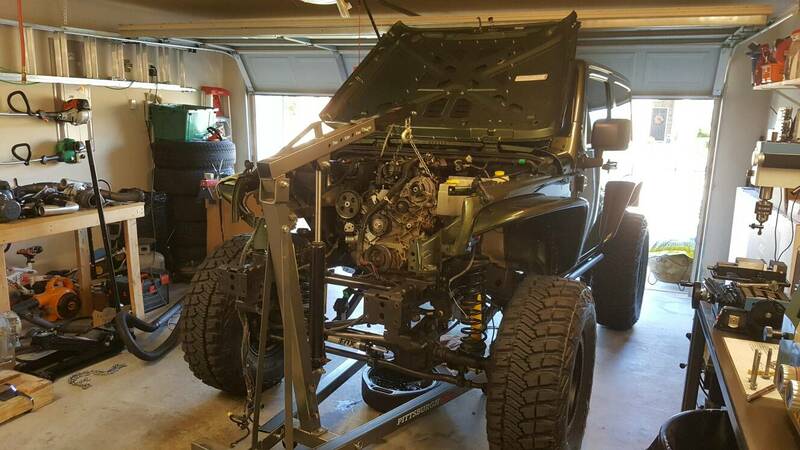 This is the date I drove the jeep into the garage for the last time with its original engine and started to take it apart. I won't bore you to death with details on that. 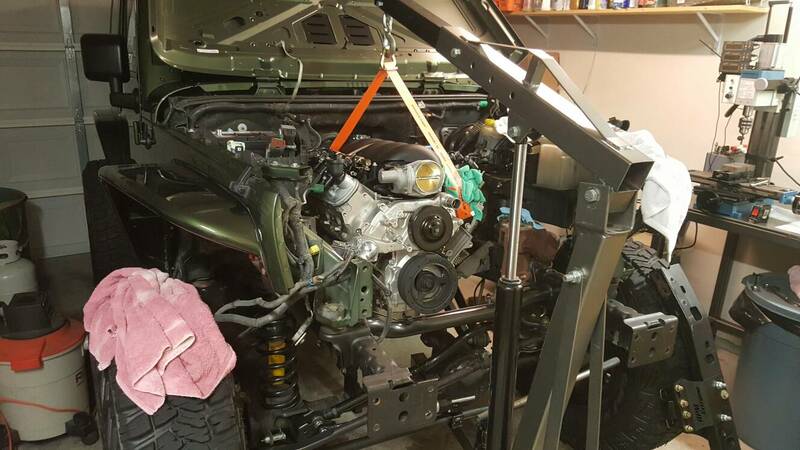 I will say that I had to remove the transfer case from the transmission from below before I could pull the engine and trans out together. 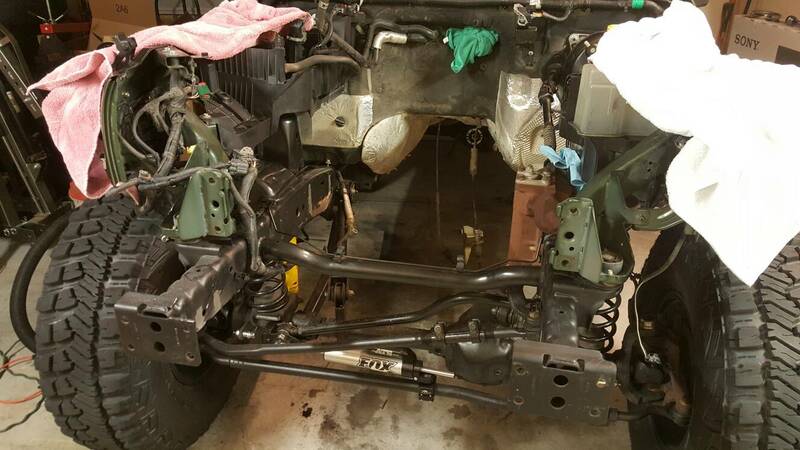 Also if you are using just a regular cherry picker type of engine hoist I had to cut the crash bar out and remove the sway bar to be able to push the hoist far enough in to be able to hook up on the engine/trans in a good spot. This wasn't really a big deal to me as the new bumper I want had me removing it anyways. Between the crash bar and removing the original motor mounts it took me about 2 hours to grind the welds, knock the brackets off, and smooth out the frame. Nothing particularly exciting about it. I like your enthusiasm, subbed. I start every mod with a thorough scrubbing of the vehicle. I can't stand working through the grit and grime as I go so I clean as good as possible before I start and then as new areas are exposed I clean those. 1eviljk and Rick Rand like this. Good luck and have fun. I know I enjoyed doing mine. Unfortunately I am horrible at doing threads as I get to involved once I get started and forget to take pics or even update a thread. Glad to see you doing this. If I see or think of anything I will be sure and post it, never know it might help out. Very cool. I'll be taking notes, stealing pictures and asking way too many questions. I am prepping to get the engine and trans in and get the new frame mounts welded in this weekend. I got the transmission crossmember fitted with the new brackets and had moved on to the transfer case adapter when I noticed that the small L shape bracket that attaches to it for the mount was not sitting flush. There is a raised area that will not allow it to sit flush. I have 2 ways to rectify this.... Either I use a washers to space it out a tad or I grind the excess away. I had to double check what side of the adapter it mounted to and according to the pics in the instructions it's on this side. It goes on the other side, facing the other way. So. L shaped bracket mounted on the front side of the lip with the L facing to the rear. 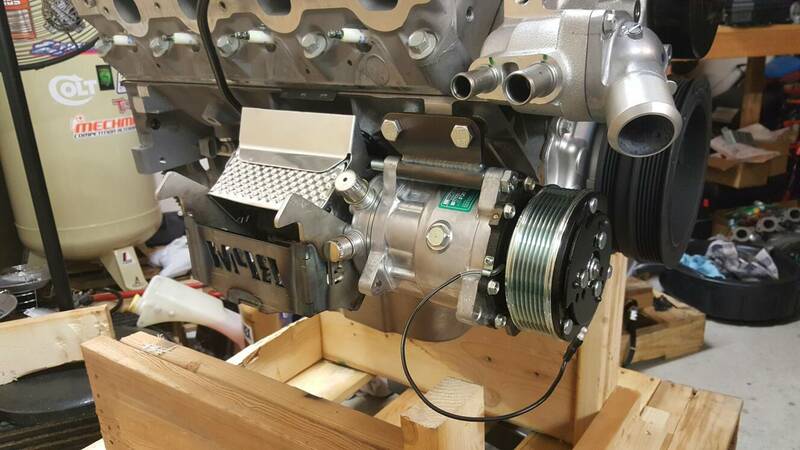 It's pretty universal and you could mount it any way you see fit especially since you have a 2 door and you may be moving the engine forward slightly. I would get the crossmember bracket mounted and drop the power train in and then lay out the mount and bracket. Is that a 2 or 4 wheel transmission? If 2 wheel don't forget the plugs and seal before you put the transfer case adapter on. 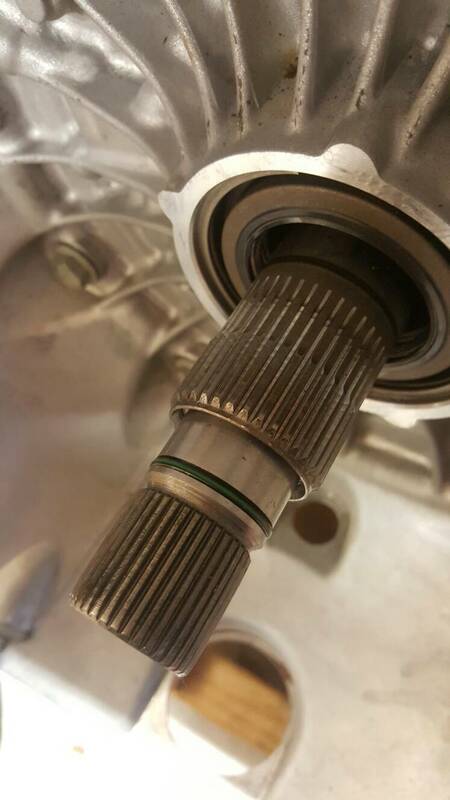 Also check the length of the transmission output shaft. It should be around .500" past the face of the transfer case mount, attached. If not you will need to shorten it. I figured there was something I was missing. The pics in the instructions show it the way I have it in the picture. With me trying to push the engine forward it makes sense to turn it around the other way. It's a 4wd trans from the get go. Plugs and seal are present. I got the RPM extreme kit. No complaints yet, I would have probably figured out the bracket once I stabbed it in there and looked at how everything was lining up. I am trying to put the cart ahead of the horse a bit with some of this stuff in an effort to save time later but I have a feeling it will just cost me more down the road. I'm just anxious to move forward with it. Does anyone think that I should replace the lip seal or this O-ring on the transmission before I mate it with the engine? The trans has 14k on it. Also what is the proper amount of fluid to dump into the convertor prior to installing it? It is a brand new convertor. Updated post #2 with some part # info and what I paid for each of the items shipped to the door. This is what I have so far that I know of for the swap. I am sure there are some misc smaller items I have forgot about. I do not own any radiator hoses for this yet nor any of the several gallons of misc fluids needed for cooling, engine, and trans. I still have to have the exhaust fabbed up and I need a rear driveshaft, trans cooler, and associated lines. Thanks for posting the parts detail. Very helpful. So this may be my first real work around on this project and to be fair it was not a surprise that this would possible be an issue. 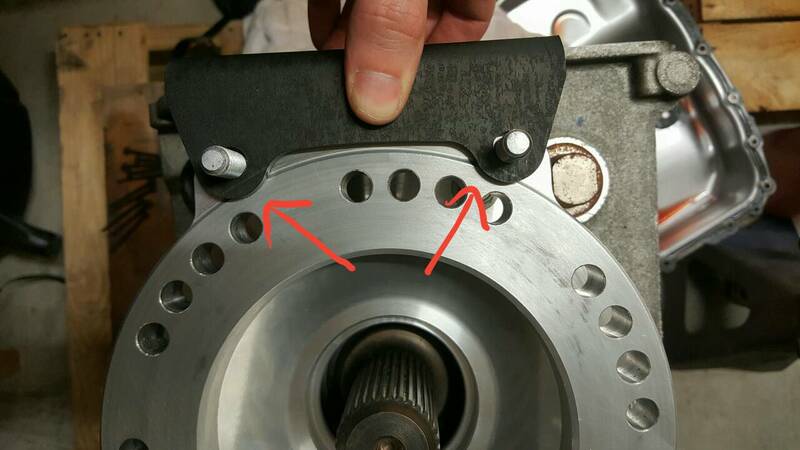 The issue is that using the offset accessory drive that I have (cts-v) which is the same as the vette offset that the a/c compressor is pushed back just far enough that 2 of the 5 bolts that hold the end cover onto the compressor interfere with the frame side mount. What it appears that I will have to do is either clearance out the frame side mount for the heads of the 2 bolts to extend into or.... machine the cover of the compressor to accept a socket cap head screw and countersink the register for those 2 bolt heads slightly into the cover while I shorten the heads of the bolts as well. I think I will choose to do the machining as I do not like where the bracket will need material removed. On top of this the hole for the bolt heads in the bracket will have to be larger than needed due to engine vibrations etc... it will need excessive clearance so a bolt head does not slap the mount. 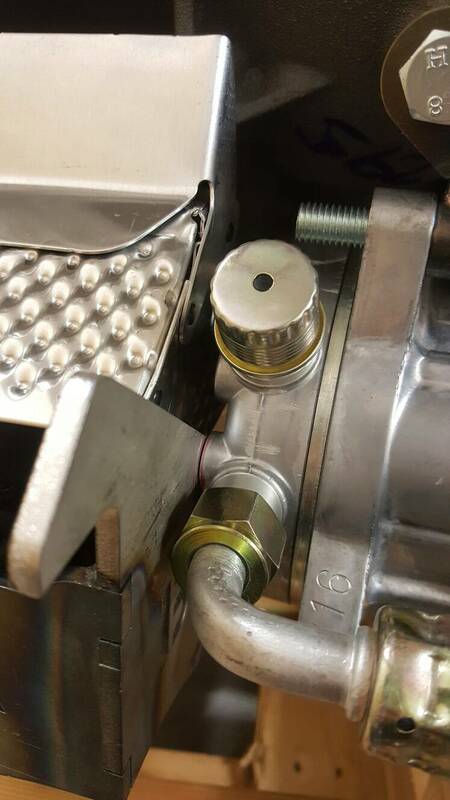 I don't need the a/c compressor cover being compromised because the a bolt head was slapped off it. My understanding is that the hyd mounts are more for the vibrations of the DOD engines. So I wouldn't think there'd be much movement. The counter sink option would be the cleanest way to go, but those mounts look pretty beefy and a couple one inch holes (or so) wouldn't harm them. I remember Jon saying those bolt heads could be too close with the CTS-V drive. I'd swap out the o-ring and seal on your trans. They're cheap and you have easy access right now. Might as well start out with 0 mileage bits. I have written in my notes from talking with Edge, that he said to add one quart of fluid to the converter before installing it. Just remember that the level in the trans will go down after first start up when the converter fills. 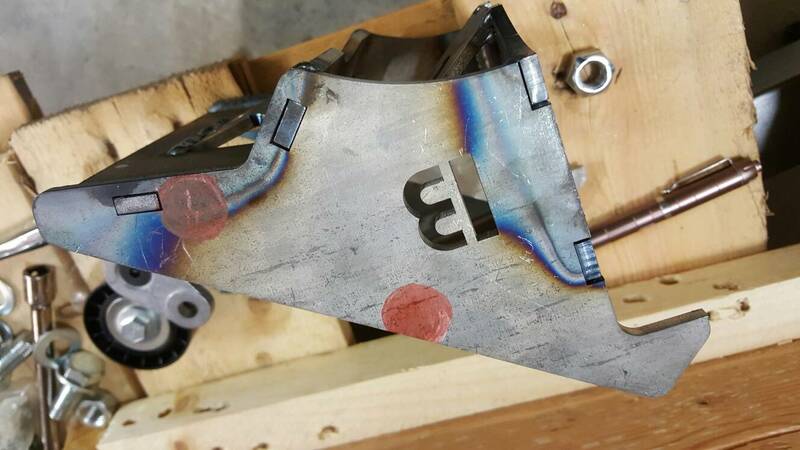 There is literally maybe .020" clearance there. 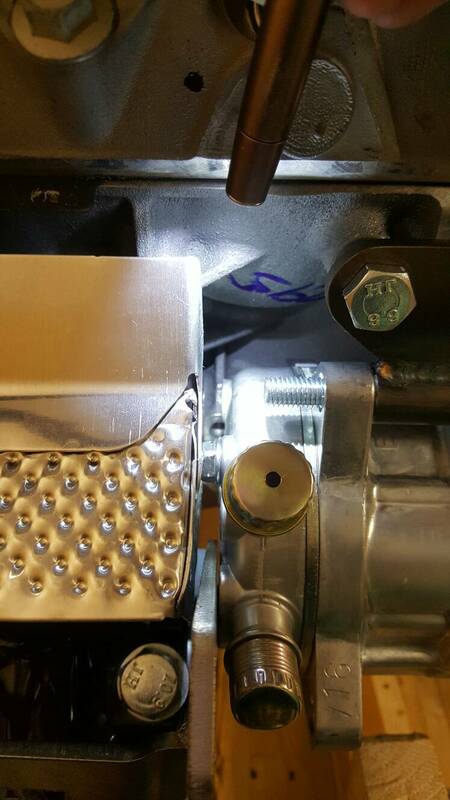 The entire head of the bolt has to either be counter sunk or milled off. I am going to try and meet it in the middle. I also while out in the garage tonight saw another option that I will play with tomorrow and keep you posted on. The Hyd mounts seem to be super spongy. I dont know if this is good or not. It seems to me that they will definitely help out for slight misalignment issues. Small sample of victory for now. Your talking about countersinking for something like this correct? 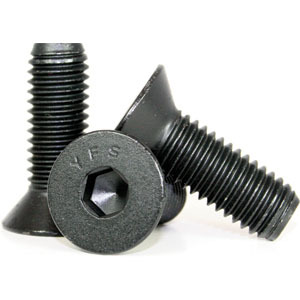 Can do that or just a typical Allen head screw.